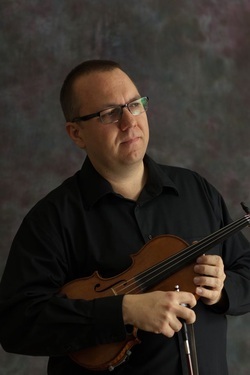 Next month, Navona Records will release VIOLIN FUTURA, a double-disc recording of 33 solo works commissioned by, performed by, and in some cases written by Florida-based violinist and composer Piotr Szewczyk. Earlier this week, we spoke with Piotr to discuss his background, his new project, and what’s coming up next. You were born in Poland and lived there before becoming a naturalized U.S. citizen. How have your musical experiences differed between here and back home? Growing up in Poland, I was surrounded by music in my family from an early age, and went to music schools studying violin and piano. I owe the United States for my inspiration to become a composer. I remember the day when I first heard “Short Ride in a Fast Machine” by John Adams and then played his Chairman Dances in the Interlochen Arts Academy orchestra. I was so thrilled and excited by this music that I wanted to study composition in addition to the violin. In addition to your undergraduate and doctoral degrees, you hold dual Master of Music degrees from the University of Cincinnati College-Conservatory of Music in composition and violin performance. How has your experience as a composer influenced your violin playing, and vice versa? As a violinist, studying composition helped me understand any music I performed in a much deeper, more meaningful way. As a composer, being a violinist that played in orchestras and various ensembles daily helped me write music in a more organic way, with the performer’s perspective in mind. Being inside the orchestra and interacting with musicians was for me the best lesson in orchestration beyond just studying books and scores, or listening passively. Could you share a little more about the history of VIOLIN FUTURA? What was your goal behind this project? My goal was to create new and exciting solo violin repertoire that I could perform in recitals. I wanted to find out what kind of music my composer friends would write for me and I was excited to bring to life pieces no one has ever heard before. What was your inspiration behind its concept? The inspiration behind was the power of miniature as a concise and powerful form of musical expression. A collection of miniatures allows for creating varied and colorful programs of different narratives. How did you select the composers you commissioned? At the beginning of the project I contacted composers I knew personally. After success of the first batch of pieces and performances, I expanded the project by announcing a call for composers who may be interested in writing pieces for me, and from those I selected the next group. Two pieces on the album, “All Wheel Drive” and “First Coast Groove,” are your own compositions. What was your writing process like for these pieces? I always start with improvisation and hand-written sketches, then fleshing out ideas. Both pieces are virtuosic crossover works. I wanted to write something fun and not-too-serious for myself to play. You recorded the album with John Hadden at the University of North Florida Recital Hall on July 19-22. How did you approach recording 33 songs in just four days? It was an intense, immersive, exhausting but very rewarding experience. Recording it all in a short time captures the intense energy of this project. We recorded about 12 pieces the first day and then continued with smaller numbers of the most difficult pieces the following days. John did a terrific job of running the sessions which made it easier for me to concentrate only on performing. Jacksonville may not be known to the general public as a hot-spot for contemporary classical music. What led you there, and what is the rest of the new music community missing out on? Getting a full time first violin position in Jacksonville Symphony led me there. There are many wonderful, creative musicians in Jacksonville that are pursuing interesting projects, concert series and recitals. I’ve had the privilege of working with many of them on different projects. I’m also currently involved with over 10 musicians in starting a new music ensemble. What would you say has been your proudest moment as a composer? As a violinist? As a composer, it would be the word premiere of my First Coast Fanfare commissioned by Jacksonville Symphony. It was an amazing experience to hear my music performed beautifully by my colleagues and friends with whom I work every day. As a violinist, it would be performing selections from Violin Futura in Carnegie Hall-Weill Recital Hall in the presence of many of the composers who wrote those pieces for me. What do you want your listeners to take away from this album? I hope they will enjoy discovering the creativity and variety of approaches living composers use in writing miniatures for solo violin. Also, how these pieces make a unique contributions to the vast violin repertoire already out there. I hope these pieces will serve listeners as a gateway to discovering more music by composers in my project. Nowadays I mostly listen to enormous amounts of very recent contemporary music of different aesthetic directions. I’m blown away everyday by how much amazing music is being written in our times and how many creative composers, ensembles, and performers are out there. There isn’t a day that goes by for me without discovering a new, inspiring living composer. What do you have going on in 2016? Besides my daily full-time job as a violinist in Jacksonville Symphony, in 2016 I will have world premiere of my percussion concerto Neural Circuits, commission for a clarinet and piano piece, premiere of my new piece for 5 bassoons, recital of contemporary piano trio music, performances at St. Augustine Music Festival and more. More information can be found on my website. VIOLIN FUTURA will be available on February 12th. In the meantime, check out the SoundCloud player below, and stay tuned for more updates!